The HOTTEST Chilli in the world? Searching for the new "World's Hottest Chile"
Read this and more articles at our Write up Gallery click here. Herewith we would like to summarize a few health facts. Recent years there has been a lot of research and every year research finds out more about the healthy benefits of the chilli. Chilli will clear your sinuses. After eating chillies your nose starts to run. Therefore great to fight off the flu or even hay fever? This is what one of our customers found out after eating our hot habanero paste Turbo Supercharge. He has had hay fever all his life. Up until he reached the hottest chilli in the world (Habanero) and after eating that for a while his hay fever has gone. Have your meals with: minimum of 4 cloves of fresh garlic, a nice chunk of ginger and a hot chilli! Do not cook the garlic, ginger and chilli but put it fresh on top of your cooked dish, say a nice Singapore Noodles. You start sweating and it clears the sinuses. Repeat until fully recovered. There has been a lot of research done about all the health benefits of the chilli and so far more than 50 common ailments are said to be cured by eating chilli. In the old days it was believed and used to fight of scurvy. Also used to prevent or cure: rheumatism, arteriosclerosis, toothache, stomach-ache, epilepsy, asthma, varicose veins and malaria. They are tonic and antiseptic. Stimulate your digestive system and if rubbed on areas of your skin it will stimulate the blood flow and for these reasons have been used also to treat sprains, rheumatic pain in the muscles of the lower back (lumbago) or chilblains (sore or swollen skin) Be careful when using because it may cause blistering or dermatitis when used over a longer period of time! Chillies do speed up your metabolism and have more vitamin C in them than any other fruit. (Yes chilli is a fruit) Also be noted that the hotter the chilli the more vitamin C they contain. Apparently the red variety of the habanero chilli from Mexico contains more than 350x the amount of vitamin C than the average orange! You can use chillies to repel your garden pest or to keep barnacles off boats. The oils in the chilli (oleoresins which are the concentrated extract or oils found in chillies) are used into the base of this special paint for boats. These chilli oils keep the barnacles at bay. 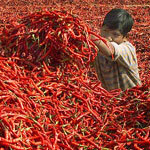 A pilot study in Tasmania has found people might sleep better if they regularly eat chillies. Researchers at the University of Tasmania have spent the past 18 months studying the potential health benefits of chillies on a group of 10 volunteers in Launceston. Some in the group were given 15 grams of chilli each day, while others did not have any. The results were compared to see what effect it had on the participant's health and well-being. Associate Professor at the School of Life Sciences Dominic Geraghty says the results were promising. "Chilli consumption may improve your sleep and, of course, the quality of your sleep very much also influences your cardiovascular health," he said. "We also found it appears to have very small effects on insulin levels, glucose levels. "So all of these small things appear to have a bit of benefit for your cardiovascular and everything else that you're supposed to be doing to keep you fit and healthy, it may help." Associate Professor Geraghty hopes the study will encourage more people to include chilli in their diet. "Chilli might be a neutroceutical, in other words a naturally occurring agent that we can just take on a daily basis in a small amount and it may actually benefit our cardiovascular health," he said. How to stop this burning pain! Avocado does a good job too. Also any product with peanuts. Sugar, banana, cucumber or dry bread. Basically any dairy product will take away the pain. The best one so far is yoghurt. Not because it takes the heat away the easiest but because it is not runny and you can keep it into your mouth to cool down. Also ice-cream offcourse this is furthermore a good excuse to eat a whole tub of the stuff. Run around berserk with your mouth open, this is definitely not a cool idea to take away the pain. Furthermore it might look a wee bit silly for some. Drinking of the following liquids makes the burning worse: water, beer or any other fizzy drink. Although tempting to let your partner know that you really need that beer to cool down it does not work, find another excuse to drink. The reason for this is that these liquids will open up your taste butts and worsen the sensation of the capsaicin, the working ingredient in the chilli. What is the hottest part of a chilli? The hottest part of the chilli is the flesh (called the placenta) around the seeds and the seeds itself. Although the flesh is the hottest part with the highest concentration of capsaicin. If you eat too much you might experiencing the following: Collapsed throat or hard to breath. Some would like to make love to their partner due to the euphoric sensation of the endorphins kicking in. 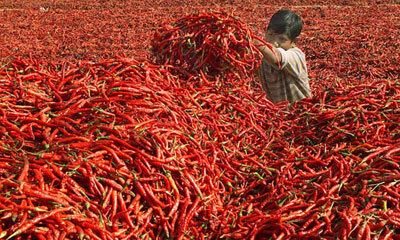 Why is chilli so addictive? At the moment you eat chillies your body wants to cool you down and take away the pain caused by the capsaicin in the chilli. Your brain starts to produce endorphins, which is a natural painkiller. And as soon as they kick in you will feel and experience a nice endorphin rush and euphoria. The natural high, this is the main reason you always want more chilli! You will experience the same sensation with sports e.g. jogging. But to my opinion eating chillies is easier and it saves you the hassle of running down the street. How can I spice up my chillies? Cook them and eat them hot. A cooked up chilli will releases the oils and therefore expand its heat. Thus making the sensation hotter. Add salt to your batch of chillies this will draw the oils out of the chilli and therefore make your chilli hotter. Also you can use white vinegar, grounded pepper, ginger or garlic to boost the heat in the chilli. Or worse, make a deadly cocktail with the lot. If this is still not hot enough try to use these artificial boosters: concentrated oils or get (battery?) acid! We do not recommend this; we prefer the natural taste and heat of our chillies. So do not try this at home please. How do you spell chilli, chili, chile & Chile? There are a few different ways of spelling the word chilli. It all depends on where you live. Christopher Columbus misnamed the chilli to pepper because he thought it was from the same genus/family as black pepper and therefore the confusion: pepper, chilli, chili (con carne) chile & Chile (Country in South America), paprika, capsicum (the Australian word for paprika and pronounced as kap-si-kum) capsaicin (working ingredient in chilli which causes the heat/pain and pronounced as Kap-say-kin.). So therefore there is no rights or wrong spelling of the word chilli just region dependent. As we say in Australia: No worries mate, she'll be right! How can I preserve my chillies? We get a lot of questions from our customers who grow their own chillies of how to preserve the harvest? There are a few ways of preserving your chillies. You can put the chillies in an airtight container or plastic bag in the fridge, this way they will last for a few weeks. Freeze your chillies, as suggested above, and they will last a few months. Put the chillies in vinegar, which is a natural preservative. Keep product out of the sun and put it in your pantry, this way it will last you for a couple of years. Or put your chillies in oil same as the vinegar. Hang them to dry. Also very nice as a decoration or create your own chilli earring. Make sauces or chutneys, but leave that up to the experts please.. The higher the capsaicin level in a chilli the better it preserves. Capsaicin is a natural preservative and therefore the hotter the chilli the better it keeps. The shelf life of our product is 2 years. However DO NOT put products in direct sunlight (dark pantry or cabinet!) Please refrigerate the product after opening. After opening the tomato-based chilli sauces and chutney's will keep for a minimum of 2 months in the refrigerator. These are the tomato-based sauces/chutney's: Fiery Frillneck hiss, Outback storm and Kangaroo punch. Whenever you are preparing fresh chillies make sure that you wash your hands before you go to the toilet and also afterwards offcourse! We strongly recommend gloves while preparing fresh habanero chillies (or picking and harvesting them). We also recommend wearing a safety helmet and goggles as well!! Be careful for the fumes coming out of the pots when using fresh chillies in any stir-fry or other cooking. A brief history of the chilli over the past few thousand years .. The chilli originates from South America where it has been used, grown and loved for the past few thousand of years. Mostly grown in the wild and later slowly cultivated. The only reason that we, the rest of the world, also know them is that Columbus tried to reach India and its herbs and spices via a different route. A few (500) years ago Portugal was having a monopoly in pepper trade, which was at that time the most precious spice in the world! To break that monopoly and also because the King of Spain got fed up with the Portuguese he sent Columbus to look and find a western route to the spices of India. He discovered (South) America and brought some chillies home. And because he thought he had found a different route to India he called these chillies peppers believing them to be related to the plant, which produces black pepper. .. and with that he started the confusion about the naming of the chilli. Also see How do you spell chilli, chili, chile & Chile? After introducing the chilli in Spain the spreading of the chilli over the rest of the world (Eastern Europe, Africa and ofcourse Asia) went very fast because everybody loved the flavour of the mild to wild tasting pepper. Today the chilli has become an essential part of cooking all over the world. And therefore Chillies are the most popular spice in the world, from mild to wild! Chilli and what does it mean? A short list of some of the main/important chilli terms used and abused. Family name for chilli. A kind of class having common characteristics. In Australia used as other word for paprika pepper which is the same family as the chilli. Smoking any chilli to preserve it. This is then called chipotle chilli. Most of the times the chilli used for this are the Jalapeno chilli because of its thick skin. (Normal drying will make it rot...that's why smoking is a better way) Best way to smoke is with hickory wood to give that distinctive flavour to your chilli. The working ingredient that gives the chilli its heat. Be careful how to pronounce otherwise it will sound like capsicum. Kap-say-kin. Any non-pungent (non heat) chilli. E.g. capsicum (Australia) / Paprika pepper (rest of the World). Piripiri is Swahilli for Chilli (meaning pepper, pepper). Originally brought back to Europe by Columbus it was introduced into the Portugees colonies of Angola and Mozambique. There it was cultivated and grown extensively and named by the locals Piripiri. From there it made its way back to Portugeese cuisine but kept its newly received name. This is a long string of (dried) whole chillies and is manly used for storage or to decorate your home with. A good way of preserving the chillies with the thinner skin types.